I’m very excited to feature my guest today – Bjork Ostrom from Pinch of Yum. Bjork is the guy behind the nuts and bolts of Pinch of Yum – the super popular food blog of his wife, Lindsay. Not only do they have amazing recipes, but a highly effective business model to back it up. They’ve seen some incredible growth, and we’ll discuss some of it here today. Telling you that I’m a huge fan of Pinch of Yum is probably an understatement. Beyond the great recipes and mouth-watering pictures, there’s an even more incredible business model (not many people can turn a food blog into a six-figure business). I understand that’s why you and Lindsay created Food Blogger Pro – to let people in on the secrets behind Pinch of Yum and how to make a food blog successful. Lindsay and I started Pinch of Yum in April of 2010. Lindsay had always been into cooking and baking and started to share different recipes on Facebook. It got to the point where Lindsay started to wonder if her Facebook friends were getting annoyed with all of the recipes she was sharing, so I suggested that she start a blog where she could post the recipes instead of sharing them on social media. I liked the idea of learning how to setup a blog (even though I had never done it), so we brainstormed names one night and came up with Pinch of Yum. The next day, I purchased the domain on GoDaddy and setup Pinch of Yum on Tumblr. A year or so later we transitioned to a self-hosted WordPress setup. The first time we made over $1,000 in a month was when we realized that it could really “be something.” $1,000 dollars a month isn’t livable in the US, but there’s something about hitting that four digit mark that makes it easier to visualize the possibility of a full-time income. Another thing that clued us into the fact that it could be a viable internet business was the type of interactions we were having with people. There were lots of questions that we would get from people asking about everything from food photography to starting a blog. It was a clue into the fact that there were areas that people might need some help with, so we’ve been intentional to try and craft helpful products to answer those questions that we often get from readers. An example is Food Blogger Pro. There aren’t necessarily any secrets or brain exploding tactics in Food Blogger Pro, but it does provide a really easy to use site that has really easy to consume videos about really common questions that food bloggers have. All of that stuff is available online, but collecting it all in one place is the hard part. You guys have had a lot of great earning months now, but what would you say has been your greatest success so far? I’m really proud of the fact that we started doing the traffic and income reports when we were making $20 dollars a month and getting tiny traffic numbers. If we were to start reporting our stats today it might seem out of reach for blogs that are just getting started, but I love the fact that you can look back over the past 30 months and see exactly how we went about growing the blog. Products have been another huge success for us. Not necessarily a huge success in that we’re earning hundreds of thousands of dollars, but a huge success in that the products are consistently being purchased and are also helping people. I do love how you can literally trace back to the days when the site was in its infancy, earning very little. It’s inspiring to see the growth every step of the way. What’s next for Pinch of Yum? What are you doing (or planning) today that’s going to take the blog and business to the next level? Lindsay and I are both really excited about the role that video plays in growing a business online. It’s the natural next step in the evolution of content online. The first step was written content, the next step was images and pictures, the third step was record video, and the fourth step is live video. We’ll be focusing first on recorded video and then (possibly) venture into live video, which is a bit scarier. 🙂 Business and blogs that “figure out” video will be leaps and bounds beyond those that don’t. We built Food Blogger Pro over a three-month period while living in the Philippines. I bit off more than I could chew and worked insane hours during a really rare and unique time in our lives. I missed out on some opportunities that I’ll never have a chance to have again. We built a really cool site, but where I succeeded on the business side of things I failed on the personal side of things. Growing a business always comes with drawbacks, and for me the drawback was missing out on opportunities and time at the orphanage in the Philippines where Lindsay was teaching while I worked on Food Blogger Pro. I think the tips learned from success in the food blog “industry” can be applied to many other industries within the blogosphere. Obviously, the food blog industry is super competitive. What do you and Lindsay attribute your success to? What can others do to stand out the way that you two have? 1. Great pictures – It’s essential for food blogs. 2. Consistent posting – It’s really easy to stop for a month or two when you get busy. A week here or there is okay, but if you really want to “make it” you have to be posting consistently. 3. Incremental improvements – Make small improvements today in order to have huge improvements over time. Let’s take a step back and look more generally at blogging or digital product creation. I’m sure you have a lot of great advice to share, but If you had to take your best advice and put it into one sentence or phrase, what would that be? Buffer – Social media scheduling. For someone who is just starting out creating a blog, especially a food blog, what advice would you offer (besides subscribing to Food Blogger Pro, which is obviously a good idea!)? What do you wish someone told you about when you first started? Content first. It’s really easy to get sucked into the details like changing the size of your font, adjusting your logo, reading other blogs, or posting to social media. The most important thing in growing a blog is the stuff you actually post to your blog. What’s one “must read book” for you? 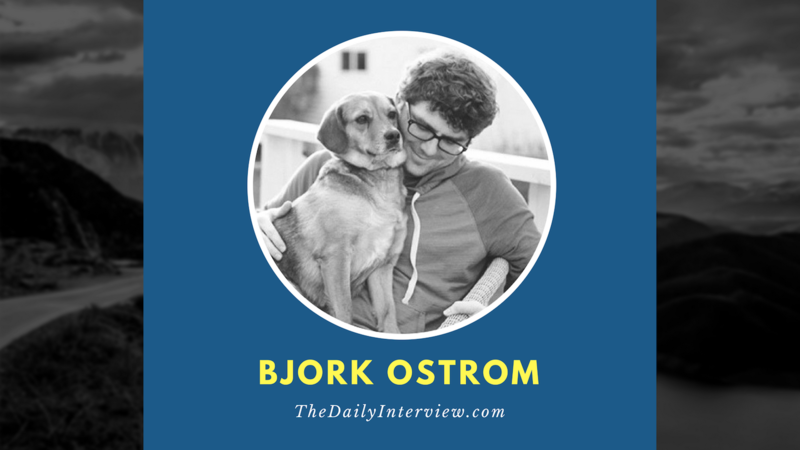 Thanks so much for taking the time to do this interview, Bjork! It’s been a pleasure to feature you on The Daily Interview. Can you believe how incredibly successful this food blog has become? It’s amazing. Leave a comment below and share your thoughts about this interview or Pinch of Yum in general. What impresses me most of these two is their consistent honesty. You see what you get. Kudos to them both for being able to display their passion and make it ‘work’. I think most of us see successful people as “those people out there.” They must have wealth or connections that the rest of us just don’t have. Watching Lindsay, one of my college roommates, and Bjork grow Pinch of Yum into such a successful blog has inspired me. I know that they are normal (and special) people that have worked hard to achieve their goals. Their success is so fun to watch. Good work, Lindsay and Bjork!